Sam Smith runs through some big things to look for throughout the upcoming season. The Golden State Warriors Friday open their training camp for the 2017-18 NBA season. The rest of the NBA basically starts next Monday. It’s an appropriate metaphor for the state of professional basketball these days. The Warriors are way out in front with everyone else pretty much bunched together chasing well behind. The NBA will have plenty of stories this season, perhaps the most speculated upon being LeBron James’ next destination as a free agent next summer. There’ll be questions about the plans of several of the league’s best players and the abilities of some of the youngest in what looks like one of the best draft classes in years. Though the drama seems much less about the eventual champion and standings. The Warriors have essentially the same team that dominated James and the Cleveland Cavaliers to win the 2017 NBA championship. Not only are they a bigger favorite this season than in any of their three previous Finals appearances, they are heading toward that sky box of NBA immortality. In going for their third championship in the last four seasons, the Warriors are on the verge of becoming the fifth great dynasty in NBA history along with the Celtics, Lakers, Bulls and Spurs. Because while the Warriors maintained their top talent, the fellow three-time finalist Cavaliers traded their second best player, Kyrie Irving. Irving went to the Boston Celtics, who made major roster changes. So did the Houston Rockets, who hope to move up. The San Antonio Spurs still feature aging Tony Parker, Manu Ginobili and Pau Gasol. They’re taking a chance on Rudy Gay coming off major surgery. The Clippers without Chris Paul? The Timberwolves with all that added offense? The Wizards? The Warriors may have their eyes on history in averaging an alltime NBA best 69 wins the last three seasons as much as on their season rear view mirror. Perhaps it’s in large part because of the way the NBA game is played today with more speed, spread out with more shooting and less contact. Kevin Durant might have been cracked like a matchstick in the 1980s and Stephen Curry may have been like his sharpshooting dad with a little better dribble. But not much longevity at that size. But that was then, and it is very different now. The Warriors are the blueprint for this era with brilliant three-point shooting, multiple versatile ball handlers, aggressive wing defenders and big men who don’t need to do much but stay out of the way. Could they have beaten the Lakers of the 80s? The Celtics of the 60s? Probably not against those huge forward lines and legendary Hall of Fame centers. But they don’t have to. Could they have beaten the Dream Team? Probably now, though not because most of those guys are in their 50s. 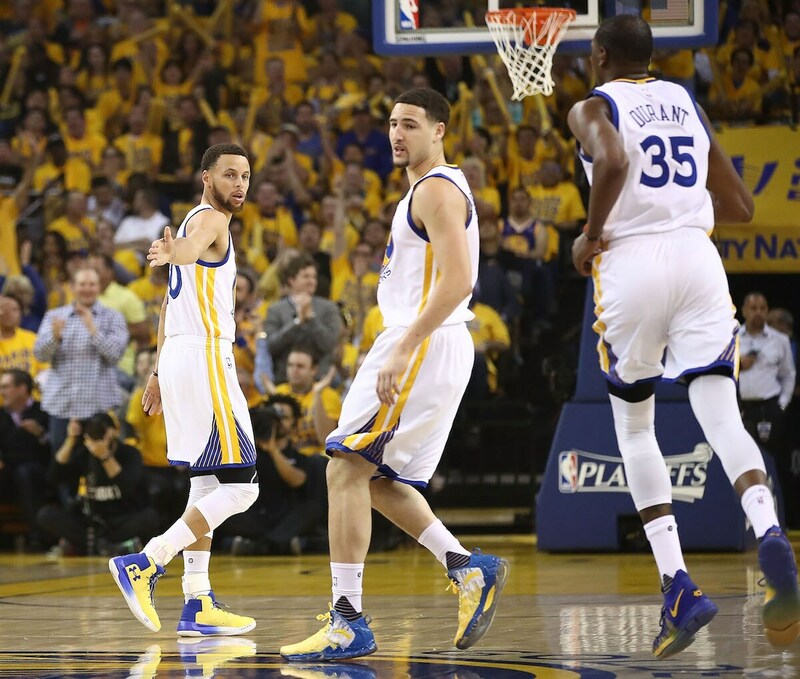 Curry, Klay Thompson and Durant combined for their career shoot better than 40 percent on threes. It’s a different era, and the Warriors fit it perfectly. Because not only are NBA uniforms changing with those advertising patches and the new Nike brand, the continuing and possible changes in the uniforms of many of the game’s top players will be a game in itself all season. Of course, the continuing fascination will be on James, who supposedly with yet another free agency next summer is ready to leave Cleveland. Unless he doesn’t, of course. There already have been stories of his family examining Los Angeles schools while Magic Johnson was fined for apparent tampering involving James, others and various late night TV guests. With Johnson taking over controls of the Lakers, the supposition has been he’ll spend big next summer for James. Or Paul George, who now is in Oklahoma City with Russell Westbrook. Or George and Westbrook. Or James, Dwyane Wade, Carmelo Anthony and Chris Paul, the summer fun buddies who supposedly have been plotting to play together as James, Wade and Chris Bosh did in 2010 in Miami. Paul is now in Houston with James Harden with a team some suggest could challenge the Warriors because of the two stars. Though most around the NBA wonder how the latest Rocket star turn will work with two players who control the ball as much as any other players in the NBA. It will be much easier to defend Harden standing on the side waiting for Paul to stop dribbling. Though maybe by Monday they’ll have Carmelo. Anthony finally waived his no trade clause now that he chased out another coach/executive in New York, this time Phil Jackson, and says he’s ready to go to the Rockets. Who basically have no one the Knicks want. So that one may continue as well. Of course, there’s the Spurs in their 10th consecutive season of being too old. Weren’t they about to sweep the Warriors in the conference finals before Zaza Pachulia fell into someone else, this time Kawhi Leonard. They’re around and so still is LaMarcus Aldridge. Rudy Gay’s shooting threes? OK. The Nuggets with Paul Millsap from Atlanta? The Clippers now that everyone can have fun again with Chris Paul gone? Jerry West is back in L.A. With the Clippers now, and who knows what changes also are ahead with that very happy owner Steve Ballmer not looking so happy after last season and Paul skipping town. The Thunder took a big chance with Paul George for one season since he apparently already is having his mail forwarded to Los Angeles. Hey, maybe Russell passes the ball. And there’s Thibs and the old Bulls gang. Former Bulls coach Tom Thibodeau has assembled a Bulls reunion in Minneapolis with Jimmy Butler, Taj Gibson and Jamal Crawford. Kirk Hinrich supposedly was even working out there. The Timberwolves have some real stuff otherwise, especially center Karl-Anthony Towns and Andrew Wiggins and what’s been---and last season as well—one of the NBA’s worst ever defensive teams. Jimmy, you take the forward. And the guard. And the center. Heck, with Anthony Davis and DeMarcus Cousins the New Orleans Pelicans might win the East. And they still may not make the playoffs in the Western Conference. Oh, yeah, that’s where Rajon Rondo is. Actually, he and Cousins hit it off well in Sacramento. And with Omer Asik and E’Twaun Moore that’s another team for Chicagoans to watch. With Chicagoan Tony Allen also there. It doesn’t seem like the Lakers will make the playoffs. Even with the additions of Brook Lopez and Kentavious Caldwell-Pope. What was that? But they’re going to be one of the major stories, if not only for the LeBron speculation. 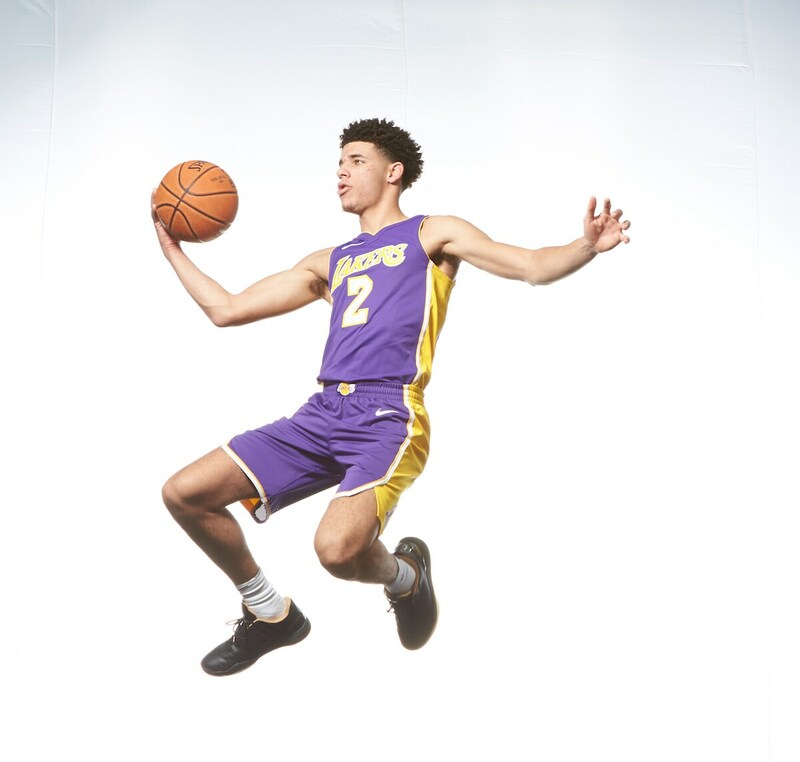 Here comes Lonzo Ball. He wasn’t the No. 1 pick, which was Markelle Fultz. We’ll likely hear more—and probably too much—about Ball, but Fultz’ group will be a lot more interesting. With fellow rookie and No. 1 overall pick delayed one year Ben Simmons and the irrepressible Joel Embiid, the 76ers will be perhaps the East’s team to watch. Not the best in the East, which still should be the Cavs. Sure, they lost Irving, but they got back a nice haul that included a potential top draft pick in what seems like another big draft in 2018 and a top wing defender in Jae Crowder. No longer does James have to pretend he has help from one of his buddies like James Jones or Mike Miller. Crowder is a real stopper and can score in double figures. They quietly added Derrick Rose and Jeff Green and still have Kevin Love. And Isaiah Thomas could get healthy. For all the excitement about the Celtics with Irving and Gordon Hayward from Utah, the Celtics almost completely changed their roster, are small up front, lost their two best defenders in Crowder and Avery Bradley to Detroit and will have to rely on young players like Jayson Tatum and Jaylen Brown. The guess is they really have their eyes on the post-LeBron East. So who else? The Raptors again? The Wizards? The Bucks? Can Jabari Parker get back from a second ACL? Dwight Howard is playing for Michael Jordan? Are the Nets a playoff team? Well, we assume the Bulls aren’t. Check back Sunday for a look at the Bulls for 2017-18. They’ll be worth a peek, and so will the rest of the NBA even as the Warriors continue to peak.